Queens, NY - A Queens community has established a plan to cope with the annual Orthodox Jewish pilgrimage — and the trash left in its wake. Up to 25,000 Chabad-Lubavitch Jews are expected to gather in Cambria Heights this weekend to pay tribute at the grave of their leader, the Rebbe Menachem Mendel Schneerson. The rebbe died June 12, 1994, but this Saturday marks the 18th anniversary of his passing under the Hebrew calendar. “It is a time to ask for blessing and to connect with his soul,” said Rabbi Abba Refson, of the Ohel Chabad-Lubavitch, the synagogue hosting the event. But the annual pilgrimage, which draws Orthodox Jews from all over the world, irritates residents in the middle-class, African American enclave. Neighbors have said some visitors hog parking spots and leave trash strewn over otherwise well-kept yards. “The ruder ones think nothing of urinating on our front lawns or defecating in the bushes,” said Richard Davis, 73. An added complication: This year the event falls on the Sabbath, meaning the Ultra-Orthodox followers cannot drive or ride the subway Saturday and some will camp overnight. Sounds pretty bad the way they describe the Jews coming to visit. People urinate on front lawns? i don't believe that statement for a second because police would be there to issue summonses if that was going on every year. I went last year and i only saw massive crowds but they were all respectful. I didn't see garbage on the floor because there many large garbage containers for one to throw out their garbage. The only issue is having 25,000 people and having major traffic. This is once a year so the neighbors should stop complaining. When they had a chance to sell their homes they didn't now the economy stinks and the neighbors are not getting the value of years ago so they are all bitter. "“The ruder ones think nothing of urinating on our front lawns or defecating in the bushes,” said Richard Davis, 73." What an anti Semite. I've been making annual pilgrimages for Shabbos of the Rebbe's yohrtzeit since 1995, and I must say that is pure unadulterated anti Semitic drivel (not to mention a massive lie). Imagine if the tables were turned and yidden spoke of African-Americans in such as way. Maybe one nut once got drunk and pished on a lawn. There is always an exception to the rule of the orderly crowds that come to the Ohel on 3 Tammuz, and always an anti-Semite to make a rule out of that exception. Like many older lower middle class "homeowners" who were sucked into the mortgage craze, that Richard Davis probably has negative equity in his home and is angry at Jews because to him, Jews are the bankers that dun him for money every month. 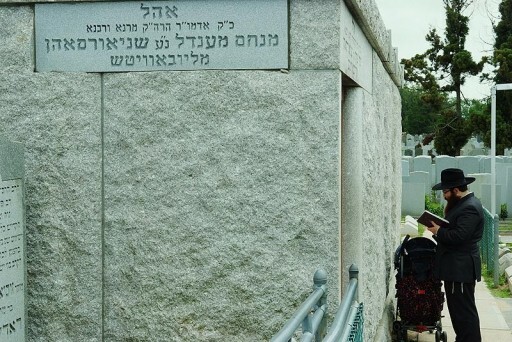 When I lived in NY I went to the Ohel every few weeks at different hours of the day to daven, as well as two consecutive years on Gimmel Tammuz, and never once did I see anything resembling disrespectful behavior to the neighbors or fellow mispalelim. Most of the neighbors are not Richard Davis either; they're hard-working people who aren't looking for fights. "Imagine if the tables were turned and yidden spoke of African-Americans in such as way." I completely agree with you! Amen! Or would MANY here on VIN, just shrug their shoulders & say: "Well, it's TRUE!" I know many Europeans aren't too happy with the annual pilgrimages of the Yidden on Rosh Hashanah either. They too say all sorts of horrible things about you folks when you go over there every year! And yet... many of you defend the Yidden who travel over there & claim all of the Europeans must have it wrong & that they must ALL be anti-semites for complaining about you folks! So why can't the SAME benefit of the doubt be given to others? Are only Jews falsely accused or mischaracterized?! Many of the Ukrainians who complain ARE anti-semites! And I feel that their incessant complaining about the Yidden coming there every year, DOES stem from a place of anti-semitism & not wanting a "bunch of Jews hanging around". But again, this sort of attitude seems to only offend you all...when it's a poor attitude directed at your own people. was there this morniing, there were plenty of ppl there, and NOONE was rude or doing anything these ppl say..
but then again, if there is only nice things to say... its not news! I WOULD defend the Jewish people, if I heard someone accusing the entire lot of them, of being messy, littering people & whatnot! After all, whenever there is a large gathering of ANY people... there is trash left sometimes! Plus, sometimes there were be a FEW rotten apples in a bunch, that can spoil the whole barrel! But that doesn't mean that the ENTIRE group or culture of people, should be shunned, treated w\disrespect, or accused of ALL doing the same things! I believe everyone should be held accountable for their OWN actions & that the family of the people committing the crimes, or the community of the people committing the crimes, shouldn't have to be ALSO put on "trial" or found to be guilty, by everyone else! I just want that system of fairness to apply to ALL! “ "“The ruder ones think nothing of urinating on our front lawns or defecating in the bushes,” said Richard Davis, 73." I for one am super offended by this piece of defacation! I think Lubavitch should go after this and sue him for libel... This is disgusting!! Then, he will lose his house, and he wont have to deal with these "awful Jews!" I go to the Ohel often, between birthdays, and family yortzeits, engagements and all, I have never blocked a driveway, and never seen anyone else blocking driveways for that matter either. Gimmel Tamuz is a somber day, not a party day like these jealous neighbors would have you believe. Don't believe the statements of the neighbors regarding the visitors "urinating on front lawns or defecating in the bushes. There are bathrooms near the Rebbi's Ohel. People will say anything to denigrate Jews and it's believed without any fact checking. Oh man what a bunch of unchecked rubbish coming from a 73yr old loser of mass proprotions of brain loss. I can't believe the DN actually printed this - makes you wonder about each and every other article they "print". I can promise you this guy has indeed no equity, no job, no life and no chance for recovery whatsoever - how sad. Like someone posted if the blacks acted on labor day in crown heights the way the jews act on gimel tamuz it would be the day moshiach came period! May the rebbe and all fellow tazaddikim on high pray for us all. Step back for one second, and see how would you like if once year 25,000 outsider decide to come to Boro Park or willie would you be so accommodating. I do not think so you do not even want a few bike riders going by you area. “ was there this morniing, there were plenty of ppl there, and NOONE was rude or doing anything these ppl say..
"there are signs by each driveway instructing ppl not to block etc"
Now, I wonder why such a precaution should even be necessary? Let me think - ahhh, of course! All those superior, "ehrliche", yidden, thinking they own the place. “ Maybe one nut once got drunk and pished on a lawn. There is always an exception to the rule of the orderly crowds that come to the Ohel on 3 Tammuz, and always an anti-Semite to make a rule out of that exception. Like many older lower middle class "homeowners" who were sucked into the mortgage craze, that Richard Davis probably has negative equity in his home and is angry at Jews because to him, Jews are the bankers that dun him for money every month. "Richard Davis probably has negative equity in his home and is angry at Jews because to him, Jews are the bankers that dun him for money every month." That comment is libellous and actionable on so many levels. With people like #6 exercising her so-called "First Amendment rights" no wonder the goyim hate us so much - particularly Mr Davis. the newspaper story made an issue out of jewish behavior. don't be so eager to dismiss a blatant lie just because it suits your agenda. “ "Richard Davis probably has negative equity in his home and is angry at Jews because to him, Jews are the bankers that dun him for money every month." this davis makes such an outragous and disgusting statement and you atttack those who disparage him? And what about the West Indian Day Parade every year in CH, with drunken and violent mobs roving the streets. The Lubavitchers there must hide out intheir homes all day or escape the premises. Unfortunately, there are Yidden who leave a mess, and are not very good about either personal hygiene, or cleanliness in areas that they frequent. When I went to the local JCC health club, there were inconsiderate Yidden, who would leave their dirty gym clothes strewn all over the locker room. At the local Kollel, there are also messy people who leave food all over the floor, as well as dirty tissues on the tables. At Kiddushes, how many people clean up? seemed very well behaved and orderly almost to a fault.. I was walking down the street in Cambria Heights with my baby in the stroller and just as I walked past a sprinkler on a lawn, the sprinkler turned on just as I was in the right spot to get soaked. As soon as I walked past, the sprinkler turned off. What a coincidence!